From the very beginning, we’ve focused on our passion: shoes. We took on the challenge of producing shoes worthy of admiration instead of standard, low-grade models that hurt your feet. Our mission is to uphold centuries-old traditional craftsmanship and offer it to our customers at affordable prices, with the help of modern technology. Over time, we’ve developed a set of values and norms that dictate the way we do business. We’ve created a strong company culture and make sure to operate within its guidelines. Instead of selling cheap, glued-together shoes in bulk, we offer a fine selection of high-quality, full-leather shoes and select shoe accessories—a »gourmet« collection, so to speak. You can read up on shoe history on our site, take your shoes to us for repair, and learn how to effectively handle your shoes during one of our shoe care seminars. These additional services are possible because we enjoy a wide customer reach and cut costs by eliminating the middleman, which also allows us to offer an exceptional value for your money. 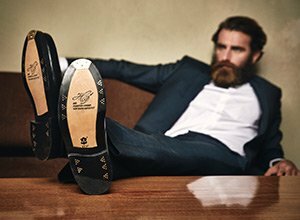 Our exciting and informative site presents a centuries-old handicraft in a fresh and modern way; let us introduce you to the world of Goodyear-welted shoes. Our customer service and in-store sales representatives aren’t the only ones at your service. Each of our departments anticipates your needs and works in your interests, from detailed product descriptions that give you a clear understanding of our products, to high-definition photos of our shoes, to the design and programming behind our website, conceived with usability and manageability in mind. We uphold our high standards in everything we do, through to the shipping stage; wrapped in elegant packaging and paired with fine accessories, our shoes arrive quickly at your home, thanks to our diligent sales team. We’re also always open to suggestions. Let’s say you’d like to see a certain type of shoe in our collection—get in touch, since we continually update our product line. Your satisfaction is our top priority! Whether it’s through our comprehensive shoe encyclopaedia, in-person consultation in our brick-and-mortar store, our detailed product photos including 360° perspectives, informative articles on our blog, videos of the manufacturing and tanning processes, or communal shoe cleaning in our shoe care seminars—we pass on our love for traditional, handcrafted footwear to you. Our beautiful shoes are Goodyear-welted, handcrafted, and priced starting at 179 euro. Since you’re buying them directly from the manufacturer (us), you’re spared the high margins that are incurred when there’s a middleman involved. You’re also spared the high cost of paying for a brand name. Thanks to our wide customer reach and low cost structure, we’re able to offer unmatched low prices for our full-leather shoes—despite the fact that we use sustainable materials and produce our shoes in the EU. Our shoes are designed in Berlin, where our company is located. The materials we use are sourced from select European manufacturers. From leather soles made by Rendenbach in Trier to the manufacturing stage in our Spanish factory, when it comes to our shoes, we rely on the very best of the best. Wow Factor No. 5 – From production to delivery - sustainable & transparent! From the provenance of the leather we use, to the production of our shoes in our Spanish factory, to coordinating delivery with our logistics partner, we have nothing to hide. We’re fully transparent about every step on our supply chain. Like the steam engine did in its time, the Internet has changed all of our lives, in ways that many have noticed, but may fail to fully appreciate. As »digital natives«, we’d like to translate our love for centuries-old traditional craftwork into an online experience. We’re convinced that one day, digital consultation will replace in-person interaction. Until then, we still have a long way to go. As digital experts and footwear fiends, we do our part towards making our vision a reality. Our technological updates always serve the concrete purpose of benefitting our customers.